Drive a Chevrolet or Honda? Don't let the name Subaru fool you. We have an all-make service lane. At Subaru of Lethbridge we are committed to keeping the cost to service your Subaru Impreza, Forester, Legacy, Outback, WRX and Tribeca as inexpensive as possible. When it comes to getting an oil change, many customers feel more comfortable going somewhere where they know the dealer will do a great job. It doesn't matter if looking to get a Subaru oil change, Honda Oil change, Chevrolet oil change, whatever. 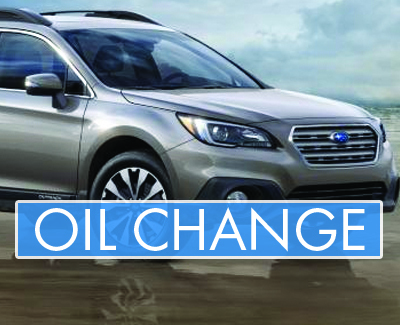 Subaru of Lethbridge provides quick lube oil and filter services for our customers. You don't have to purchase a car from our dealership in order to get your vehicle serviced here. We offer the recommended transmission oil change services to any new and current customer in the Lethbridge area. In addition to oil change services, we also offer tire rotation, brake service, and more. Q: DO I NEED AN APPOINTMENT TO GET AN OIL CHANGE? A: No appointment necessary! If you wish to make an appointment, you can book below, but if you're on the road now, just drop in. Q: SHOULD I BE USING SYNTHETIC OR CONVENTIONAL OIL? A: Synthetic oil helps provides longevity and just better performance for your vehicle. It bonds to engine parts providing a layer of protection that surpasses the protection afforded by conventional oil. Synthetic oil will also continue to pump through your engine when conventional oil would start to thicken in cold temperatures or break down from heat. Synthetic oil is especially recommended for vehicles that are driven in cold climates – it will help you start your engine when the temperature drops to -40°C. It is also good for high stress situations, such as pulling and towing. Remember, you can always switch back to conventional oil after using synthetic oil.